Note: I have stopped developing this plugin. However Dominik Reichl has created a version that is compatible with KeePass 2.17 for those of you who would like to use it anyway. No bugs have been fixed and I haven’t tested it. You have to see for yourself if it runs without problems. 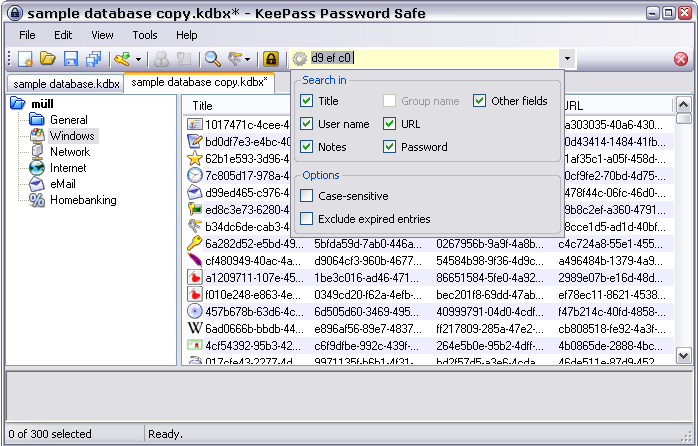 QuickSearch is a search plugin for KeePass Password Safe v2. It can be used as a replacement for the built-in QuickFind toolbar control. separate character strings by whitespace. A password entry is a match if all strings occur within a single one of its fields regardless of their position in the field. Warning: If you search in fields that have in-memory-protection they will get decrypted and thereby stay unencrypted in memory for a while. – While QuickSearch has focus changes to your database (add/remove/modify entries) won’t be regarded until it has regained focus. – The DropDown of the toolbar control has no purpose. Great plugin, but, how to remove old search box from toolbar? 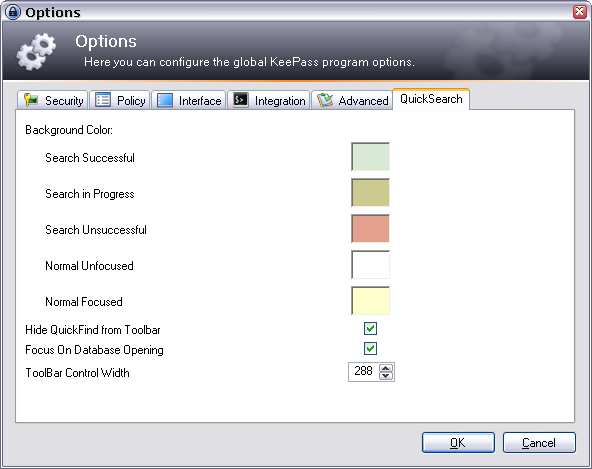 In the KeePass Menu bar click Tools>Options>QuickSearch. Enable the checkbox “Hide QuickFind from Toolbar”. You can also see it on the 3rd Screenshot. When opening KeePass 2.14 with the QuickSearch.dll installed I receive an error that the QuickSearch plugin is not the correct version for this version of KeePass. Do you have the plugin available/compiled as a standard PLGX plugin? Currently I’m on vacation, sorry. I’m going to release a new version that is compatible with 2.14 when I’m back home (maybe in a week). I will try to make a PLGX plugin, too, so that we won’t have compatibility issues with future versions of KeePass. I have tried to make a PLGX file but KeePass can’t load it. So there won’t be a PLGX version released. I am using KeePass 2.14 and your dll 2.1.4.3012 that is dated 14 01 2011 that I beleive is the new version? I still get the message that is is not compatible. I am running KeePass as a portable app from the downloaded .zip. Please advise. You’re using the correct dll. However I cannot reproduce the problem. I am using KeePass from the downloaded zip file, too. Let’s see if others report the same problem. I deleted the quicksearch.config (may I should have done that anyway) and the problem is solved. 1.) It’s not possible to search the folder/sub-folder names. Will that be implemented? 2.) If I search for “test” I will get 5 entries. If I continue typing and end up with “tester” the search field turns red (no entry found), but there are still those 5 entries displayed, that matched for test. I think they should be removed from the list, and an empty list should be displayed, if there is no match. 1) I’ll put it on the todo list. But don’t expect changes too soon. I don’t have mucht time at the moment. 2) Why do you think this should be changed? Please explain what use such a feature would have for you or others. b. you can look through the list of 5 entries that were found for “test” and find the the entry you were looking for manually. Did you upgrade from an older version of QuickSearch? If you did, does it help if you remove the ‘QuickSearch.config’ file? If this does solve the problem please tell me. Then there might be a bug in QuickSearch. I did not upgrade. This was the first test. I installed many Keepass plugins before (as you might guessed already 😉 It looks like there is a bug in quicksearch? Thank you for the info. It’s probably a bug in QuickSearch. I am going to investigate it as soon as I find the time. sorry, no. I will post here as soon as I have any. The match anywhere function does not function. The search gets the words from the name of the entry, but it does not search through the note field. So when I look for a word used in the note, I have to use tho default search. Is it a bug? Otherwise I really like this plugin, the instant search is very convenient. So far the only suggestion I can give you is to check the ‘Notes’ checkbox under ‘Search in’. Also note that all the words you enter have to occur in the ‘Notes’ field. You can’t mix words from the Notes field with words from other fields. At the moment I have no working computer. I will do my own testing as soon as I have one. It helped. I have not been aware that when I point at the search icon, that it will turn into options. It would be nice to have that also in the Settings accessible from menu. I think that many user may enjoy having a switch “Always search in complete tree” that will not limit the search to the branch, that is currently selected in the left pane. I’m using Keepass Portable and when I try to install the plug-in nothing shows up. Is it compatible with Keepass Portable? it should be but there seems to be a bug if it is not working. I will have to investigate it. I’m using this with KeePass Portable with Portable Apps, KeeFox and FireFox 4.0. All these work for me and work together. I did have an issue installing as I put the .dll in the plugins directory and it doesn’t work there. It goes in the KeePass directory. Hey, nice plugin! I’m wondering, is it possible to add ways to search based on create / modify date for the entry? For example, search for 6/*/2011 to find anything modified in June 2011, or some way to find entries changed in the last X days. I don’t see an easy way to implement this. I think only very few users would need this. Because I don’t have much time and other planned features are more important such a function probably won’t be implemented. Could you make this search to behave like lastpass search? After search something if you press enter the first element in the list will be automatically open, login into the website, and the keepass interface hide. Great plugin.. but I think it’s worth mentioning you shouldn’t put this dll in the plugin folder, but in the root. (Next to keepass.exe). This way it will work. (I’m using 2.16). You won’t get a message about a incompatible plugin..
steve88, Thanks for that information that fixed the problem I was have been with the plug-in. Seems to be working well now. profon, you should place it шт the description! Message: Unable to cast object of type ‘KeePassLib.PwEntry’ to type ‘KeePass.UI.PwListItem’. not working with KeePass v2.17. brings the application to crash. OK, thanks for the info. I have added a note to the top of this page. Soory for stopping development, it would be very usefull to have a app like yours. Do you know if there is any similar app? no, as far as I know there is no other plugin like this. Personally I use another password manager (Password Agent) that has a similar feature. Than be so nice and put it on a open source platform like Sourceforge or similar. Maybe you will find someone, who’s willed and able to continue development. 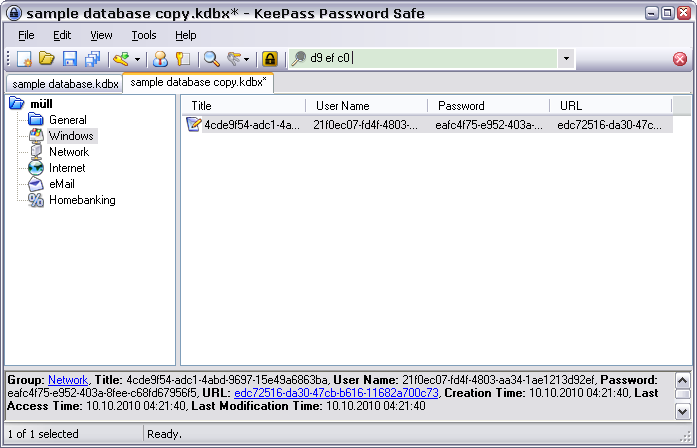 It was a very useful extension and I’m very happy with KeePass. I’m not so deep into coding, but that’s just an plugin for a .NET Framework using piece of software. Someone could update it with just a few lines of code, hm? At the moment I’m too lazy to put it on sourceforge because then I would have to think about a license. There might be only a line that needs to be changed in order to make it compatible with KeePass 2.17. However this won’t fix all the bugs this plugin still has. But it was a bit faster than KeePass’ internal search feature. Maybe you’ll someday find a bit time and think about a license. Possibly Dominik could take it over and make it part of KeePass by replacing its internal search feature. Dominik Reichl has sent me a version for KeePass 2.17. I haven’t tested it myself so I offer it as download without any warranties. Very well working! Thank you, Dominik and Profon! Dominik Reichl, Thanks you !!!!! I am trying plugin version by D. Reichl with portable version of KeePass 2.17. I have checked ‘search in Notes CTRL-F’ but searching in Notes doesn’t work for me :-(. Dominik’s version 2.17 DOES WORK in version 2.19 of keepass. Have been missing this feature from Password Agent. Please keep up the development. That’s because you’re using different version of .NET. If you update some components via windows update, KeePass often needs to compile some plugins again and now you’re in the trap, that it won’t work with latest version of KeePass. If it worked for you with 2.18 and you just updated KeePass to 2.19 without updating .NET in the meantime, the plugin will still work. The author needs to update it again for latest version of KeePass. Works in 2.20. Dominiques version. Thanks guys. Just tried Dominik’s version with 2.22 portable, working ok here. QuickSearch 2.17 works with KeePass v2.24. It must be placed in the KeePass root directory, it doesn’t work in a subdirectory. Hi, This really is a great plugin. It is working only for keepass v2.24 and not for v2.25. Please update the plugin for v2.25 version (If possible release a plugin that is compatible with all future versions). I am not using latest keepass without this plugin as I am addicted to quick search !!!! where does one find Dominik’s version? was hoping there was an ongoing version newer than 2011. New to keepass, seeing “quick search” in options, thought they might have updated in 3 years. I just installed the new Keepass 2.26 over my existing (portable) 2.25 version. All of a sudden QuickSearch.dll (the latest 2.17) is marked as being an incompatible plugin. Checking the details it seems a dependency problem, but I’m not a programmer, so I can’t really say if this is due to Keepass or the plugin. I can confirm that Quicksearch for KeePass 2.17 is working with KeePass 2.27 (portable install). Just place the DLL into the main folder of KeePass. Anonymous, Thx for the heads-up. Indeed with Keepass 2.27 portable it is functioning again. with Keepass 2.27 I can’t use it without error. It always says something like UI.Label can’t bei transformed. Maybe it is an error with the other plugins I use. But the Main Idea of the search plugin is great. If you have any objection to me using your source code for this, please just let me know and I’ll take it down. Hi Profon, I’m going to move your plugin to github and try continuing development of this plugin. Please let me know if you have any objections. Good. I wish you success. But I recommend that you change the icons. I don’t remember where I got them. They might be copyrighted. Can you post the repository? But I don’t have enough time to contribute anything….